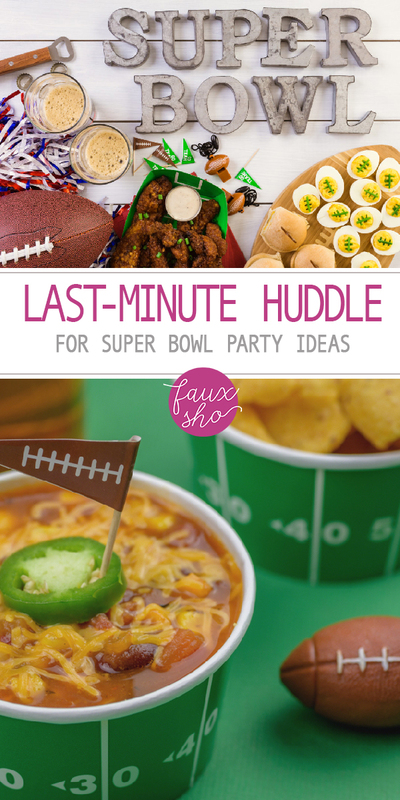 It’s that time of year–time to plan another Super Bowl Party! You may not care much about the game itself, but that’s okay. We’re here for the party and the food! 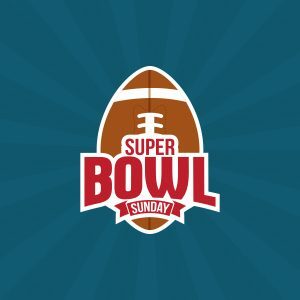 Stick around for some great Super Bowl party and food ideas that are sure to be better than a touchdown pass by your favorite team. You can’t lose! The football fans at your Super Bowl party are pretty much going to be glued to the television. So the most important part of your set up is to make everything centered around the TV. If you have a coffee table right there, that’s the best thing to use! Move everything that you normally have on display there so it’s safely out-of-the-way. Now cover your coffee table with some kind of table cover that will protect the surface from food and drink spills. Amazon has a great deal on a 3-pack of Super Bowl-themed table covers you can use for that, as well as on serving tables nearby. 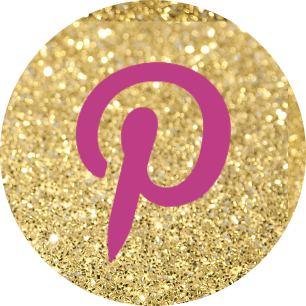 Grab throw pillows from around the house and toss them on the floor to use for extra open seating around the TV and coffee table. The idea is to comfortably seat as many as you can, so they can move around easily to enjoy the food–and the game! 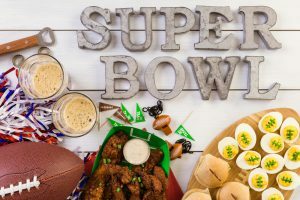 There are lots of Super Bowl party food ideas we could talk about, but we’re going to focus on things that are easily served and easily eaten in front of the TV. No steak dinners here! One Super Bowl favorite is extreme nachos. Check out Serious Eats for some seriously delicious Super Bowl nacho recipes. They have 12 variations! Finger foods are the name of game when you host a Super Bowl party. 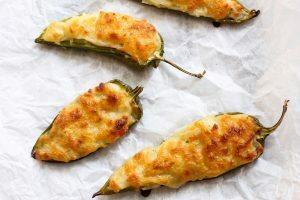 Try jalapeno poppers from Brown Eyed Baker. 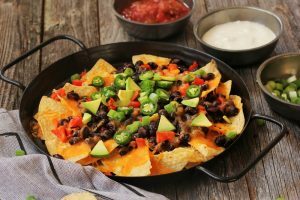 If you decide not to have nachos, chips and salsa is another great finger food to serve. Meatballs, popcorn, hamburger sliders or make-your-own sub sandwiches are other deliciously easy options. 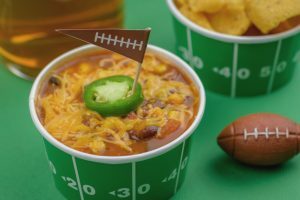 Some people love to feature chili at their Super Bowl party. Try serving it in football-themed paper bowls. It looks awesome, and clean up is a breeze! Amazon has a Super Bowl 53 party pack with plates and napkins in a fun design. To make things easier, assign guests food items to contribute to the festivities. You could assign out beverages, fruit, condiments, and sweet snacks. The more you assign out, the less you have to worry about yourself. 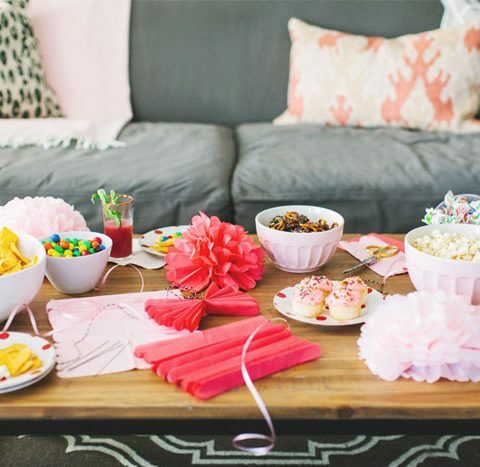 Whatever you do, don’t stress and have fun with your Super Bowl party this year!